Lifespan: More than 100 years. Leaf retention: Drought and cold deciduous. Growth rate: Slow to moderate depending on water. Mature Size: 10-20' high and wide. Flowers: Five petals, the top one white, the other four pale yellow, edible. Fruit: The seed pod is tightly constricted around its seeds. The beans are edible and can be eaten raw when small and green, or cooked when mature and dry. Leaves: Tiny, green, oval leaflets, missing if the tree has been exposed to drought. This tree provides light filtered shade. 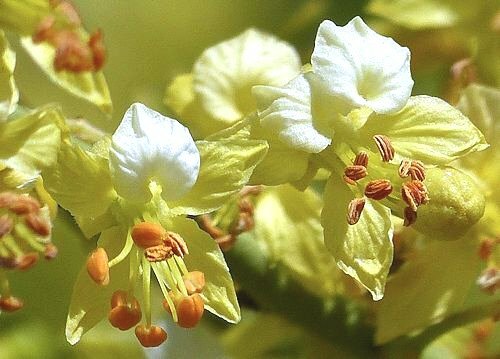 Stems: Yellow-green, photosynthesizing, with pointed and spine-like branch tips. Branches may be shed during a prolonged drought. 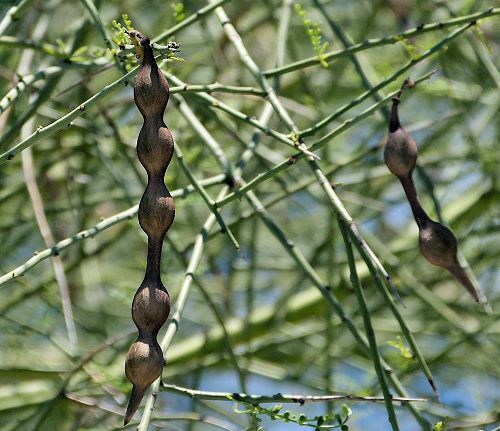 Wildlife: The pods and seeds attract birds and mammals. Toxic / Danger: Spines at the end of branches. Water after becoming established: Deep water monthly during drought. Soil: Well drained, dry, low in organic content, pH 5.6-8.5 (acidic to alkaline). *Do not use a nitrogen fertilizer. Prune: Only when necessary to raise canopy. 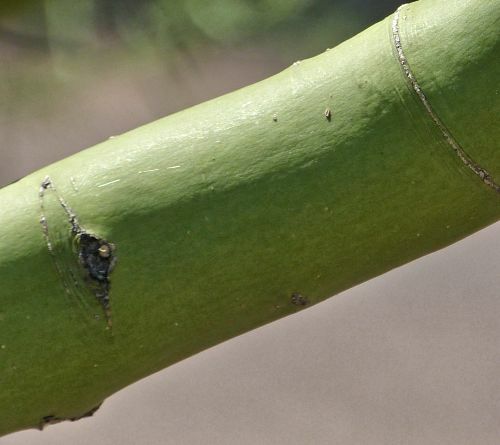 Start early to avoid cutting large trunks or stems. Litter: Seed pods, and in prolonged drought, branches. Propagation: Seed, scarified and soaked. This plant is a member of the Legume family (Leguminosae) with a scientific synonym of Parkinsonia microphylla. 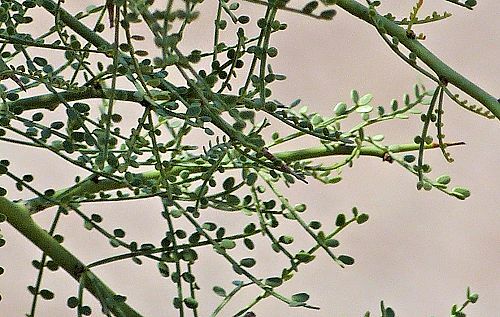 Other common names are Foothills, and Littleleaf, Palo Verde. 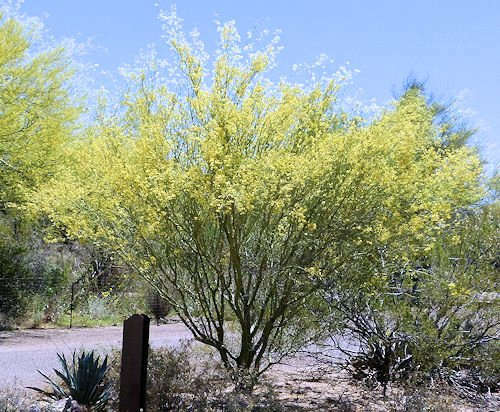 In contrast to other palo verde species, this tree is pale yellow instead of vivid yellow in full bloom, smaller, more drought tolerant, more likely to be leafless, and has a slower growth rate. It does better below 4000 feet elevation.